Joe’s love for fishing began at a very young age, mostly fishing freshwater creeks around the NSW North Coast chasing natives like the Australian Bass and Eastern Cod. This passion only grew throughout his late teens and by this time Joe had started his assault on more saltwater species, particularly flathead and mangrove jack. In his early 20′s Joe fished his first ABT competition, a bass electric at his closest freshwater impoundment at the time, Toonumbar Dam. This started his addition to competition fishing as he found the extra pressure of the event only added to the whole experience. By his mid 20′s Joe had located from the North Coast to QLD’s Gold Coast and started to compete in both Bream and Bass pro events an an amateur. In 2010 Joe won his first bass electric event at Wivenhoe Dam with a monster bass of well over 50cm and close to 3kg’s in weight. He has had two top three finishes in ABT Bass grand finals in this category, both at the mecca of monster bass, Somerset Dam plus numerous top 10 finishes in both bream and bass individual and team events. In 2010 Joe won his first bass electric event at Wivenhoe Dam with a monster bass of well over 50cm and close to 3kg’s in weight. 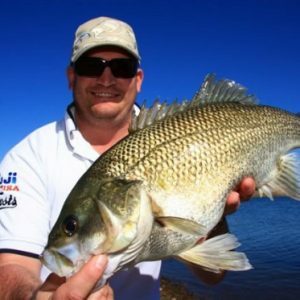 When social fishing Joe loves to chase both mangrove jack and bream on top water throughout the waterways of his home river, the Nerang and its maze of canals. His favourite set up is the Samurai 101 matched with a Team Diawa Exist 2004, Unitika 6lb braided line connected to a Bassday Supar Pen 70. Joe’s other interests include rugby and cricket which he still plays grade in both forms. His day job is as a manager of two Real Estate offices within the Ray White Surfers Paradise group on the northern end of the Gold Coast.